After clicking the button, you will see a shopping cart with your 30% discount already added. You must then proceed to www.ResumeWriters.com and select the resume writing services that fit your situation. Once you complete your order, the 30% discount will already be applied when you check out. * Currently employed in the industry, or employed in the mortgage industry in the last six months. Limited time offer. Thanks to the NAMB and Mariah.com. A resume for a mortgage broker or real estate financing professional can be one of the more complicated resumes out there. 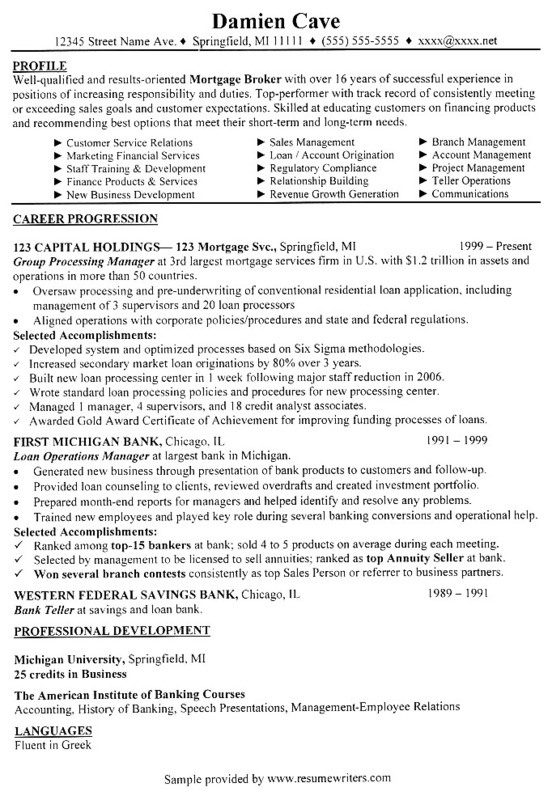 A mortgage broker must be able to demonstrate a mastery of complex financial and banking products, combined with strong customer relations and client management skills, a comprehensive understanding of the real estate market... all while hopefully demonstrating a progressive history of sales and revenue growth. Like many other professionals in sales and marketing oriented industries, it is crucial for mortgage brokers to be able to highlight demonstrable sales success on their resumes. It's fine to describe your previous positions in the traditional way: ("At position A I was responsible for tasks X, Y and Z.") but it's far more important to show that you can get results. Put yourself in the shoes of a hiring manager. Let's say you have two applicants with similar backgrounds and levels of experience. However, candidate B has shown on their resume that they have generated revenue increases at every position they've held. Who would you hire? You want to show the hiring manager that if they decide to add you to their team, you will likely make a tangible impact on the bottom line. As a resume writing professional, the first thing I would ask of a client in the mortgage broker industry would be: "Can you give me some solid numbers in terms of sales/revenue generation?" I'm not just talking about general numbers ("Managed a division with $200 million in assets.") though these are great. Even better would be if you could demonstrate dynamic numbers ("Increased lead acquisition 30% portfolio-wide in only 6 months."). After you spend a few sentences describing your responsibilities and duties at each position, utilize a bulleted list below your description to highlight key accomplishments, sales numbers, awards won, etc. for each position (the sample resume above is a good guide). A skilled resume writer will be invaluable in helping you identify and select the accomplishments that will have the greatest impact. The real estate finance industry is filled with hundreds of different products and services. As a mortgage broker, you're not just selling widgets, you're working as the middleman between banks and potential clients to market complex financial products. The more experience you can show with different types of products, along with a mastery different levels of financing instruments, the better off you'll be. There's no telling the sort of needs a potential employer might be looking to fill. If you can show that your experience is wide and varied, you're more likely to qualify to fill their current openings. A strong client management/customer service acumen is key in the mortgage industry. A solid mortgage broker resume will not simply list duties and responsibilities— it will also make room to highlight your ability to identify, acquire and manage a relationship with clients. Again, solid numbers might be helpful here. If you can highlight the number of clients you managed in your portfolio— or the number you acquired, maintained and generated multiple sales to— all of this can be helpful. When describing your job duties, be sure to highlight the various methodologies and programs you used to manage your client relationships. This is similar to outlining your skill set: if you can show you have a comprehensive ability to manage clients, then you can come across as a seasoned pro. It might even be helpful to mention specific clients or relationships you had in previous positions (banks, lenders, brokers, managers, etc.) if you think these would be impressive names to drop. On some resumes we write, we tend to de-emphasize training and education, in favor of emphasizing experience and accomplishments. But since the Mortgage industry is so dynamic and currently in such a state of flux, highlighting training and certifications might be beneficial. Similar to how we suggested highlighting your experience with a wide range of products and markets, showcasing your training background might help qualify you for what the hiring manager is currently looking for. As the sample resume above shows, you can choose to put your training and certification near the end of your resume, or even tie it in to your education section. But if you have a comprehensive training background, don't be skimpy with it. Show what you can do!